As scorekeeper, you may be called to do the score sheet or the score board. The opposing team will provide a scorekeeper to do the other activity. The scoreboard operator is responsible for operating the game clock and keeping score. At any timeout signaled by the referee. This includes the timeout that the referee will call around the 4 minute mark. It is proper etiquette to remind the referee that we are nearing the four minute mark for substitutions. First and Third Quarter: The clock stops on the referee’s whistle during the last 10 seconds of time. The clock begins when the referee drops his hand. 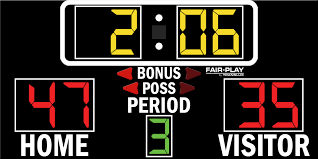 Second and Fourth Quarter: The clock stops on the referee’s whistle during the last 2 minutes of time remaining. The clock begins when the referee signals with his hand. The referee will signal with his hand a successful field goal… but it’s pretty obvious without the signal. Each made field goal is worth 2 points and each made free throw is worth 1 point. You should be continuously talking to your counterpart on the score sheet to ensure the scores match. For leagues using the 3 point line, a three point shot is signaled by the referee with both arms ups (like a field goal in football). The scoresheet operator is responsible for the running score, tracking fouls, and timeouts. Two points for a made field goal and 1 point for a made free throw. Only the running score needs to be updated. Mark off time outs for each team as they are charged by the referee. Each team gets 4 per game. Warn the team at 3 timeouts. If a team calls a timeout when none are left, notify the ref. Special rules apply to overtime. Check the rules online for this. At the beginning of the game the scoresheet person should fill out the player numbers for our team and ask the opposition scorekeeper to do the same for their team. Only numbers are required, names are optional. When a player commits a personal foul, the ref will identify the team (color) and number of the player committing the foul. The score keeper needs to check each foul as they accumulate against the players. When a player accumulates their 3rd and 4th personal foul, the coach should be notified. When a player receives 5th personal foul, she has fouled out and the referee and other coach must be notified. Note: For every personal foul, a team foul is recorded. When the 7th and 10th team foul are recorded, the referee needs to be notified.